Mali Larrington-Nelson is planning to travel from Stanmore to North Greenwich, tracing (as far as possible) the path of the Jubilee Line. Mali’s great uncle has been attending the Centre for several years and Mali wanted to show the family’s appreciation of the work done here for him and others with MS. 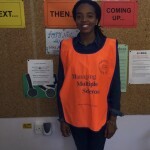 If you’d like to sponsor Mali you can do it through the Centre or Mali’s JustGiving page.